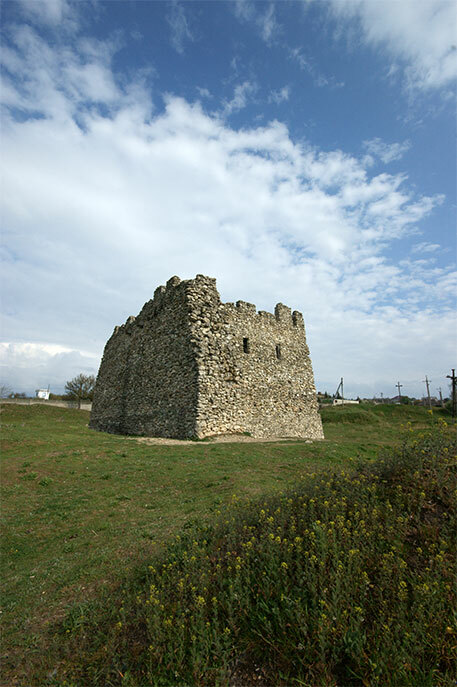 The ruins of the ancient fortification on the Kermenchik plateau in the early XIX century were actively used for the extraction of building stone. In 1827, the collector of antiquities AI Sultan-Crimea – Giray map Giray met a wagon, which carried the stone with Kermenchik. On it he noticed a limestone slab with a relief image of a horseman, limestone and two marble pedestal with Greek inscriptions. Sultan-Crimea-Girey bought these stones and reported them to the Director of the Odessa Museum of antiquities IP Blaramberg, who arrived here, made small excavations. Fragments of limestone and marble reliefs, several gold plaques and a fragment of tile with stamp were found. Famous Russian archaeologist count as Uvarov conducted a significant amount of excavation on the settlement in 1853, he noted that Naples originally emerged as a Greek settlement founded by immigrants from the island of Rhodes, but later turned into a residence and fortress of the Scythian kings. In 1926 the construction of the reservoir, designed to provide water to growing Simferopol, began on the settlement. The Eastern section of the southern defensive wall was destroyed. Small excavations within the pit and the route of the water pipe at this time led by a talented Crimean archaeologist N. L. Ernst. By him in 1927 he was investigated a few punches tombs in the Western necropolis. Immediately after the end of world war II, with the involvement of German prisoners of war, large-scale excavations began in the area of the Central gate, which included studies of the burial chamber of the mausoleum of Skilur and the southern part of the defensive wall. It made the most momentous discovery in the history of research of the Scythian Naples – West tower-mausoleum layered burials of the Scythian nobility. Excavations were carried out in 1950, was also opened the “house with porticos”, granary, researched the plot with ground tombs of the Eastern necropolis. From 1954 to 1959 excavations were carried out on the territory adjacent to the Central gate and on the Eastern necropolis. Megarons were discovered-peculiar palaces of Scythian nobility and new felling crypts were investigated. In addition, in 1953 began the reconstruction of water treatment facilities in Simferopol, which implied the destruction of many objects in Naples. The period from 1954 to 1963 was mainly of a security nature, within the limits of construction pits the route of the Eastern defensive wall and the adjacent complex of buildings were investigated. At the same time, the search for the Acropolis (the administrative and cultural center of the city) was inconclusive. From 1978 to 1988, O. A. makhneva headed the works. Under her leadership, has been investigated and the ash pan No. 3 with the remains of the sanctuary of the “Three menhirs”, the suburban territory and parts of the Eastern necropolis. Until 2011, Naples did not conduct large-scale research, there were only small excavations in the 1989, 1990, 1991, 1992, 1993, 1999, 2003, 2004 and 2005 Excavations of a site of the Western defensive wall of the last 2 years gave important results about the beginning of functioning of fortress – since 80 of 2 century BC that was confirmed by the stamp handle of amphora of the Hersonissos production. In 2011, at the initiative of the Crimean Republican Committee for the protection of cultural heritage, the Historical and archaeological reserve “Naples Scythian”was created. Within the framework of its activities, works on clearing and reconstruction of the territory of the southern Palace with the section of the route of the southern defensive wall and the mausoleum of Skilur were started. By the end of 2011, part of the territory was prepared for excursion service and now is an exposition of the reserve.